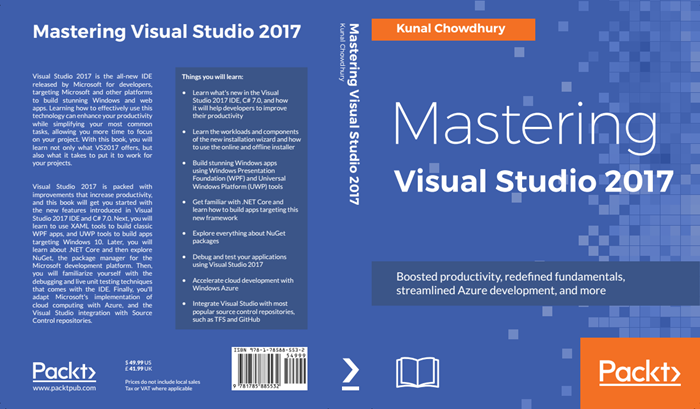 My book, 'Mastering Visual Studio 2017', is now available on Flipkart at a discounted price. This book focuses on coding with the new, improved, and powerful tools of Visual Studio 2017. It covers topics on improved debugging, unit testing capabilities, accelerate cloud development and many more. If you are a developer, using Visual Studio, you won't want to miss this opportunity. Grab the book now, as it's available at a discounted price. Kunal Chowdhury has been a Microsoft MVP (Most Valuable Professional) since 2010, starting with Silverlight to Windows app development. He is also a renowned public speaker, active blogger (by passion), and a software engineer (senior/technical lead) by profession. Over the years, he has acquired profound knowledge on various Microsoft products and helped developers throughout the world with his deep knowledge and experience. You can contact Kunal via email at books [AT] kunal-chowdhury [DOT] com. You can also follow him on Twitter at @kunal2383 and become a part of his major fans on social media channels for the updates that he shares over there. If you have come this far, it means that you liked what you are reading ('Mastering Visual Studio 2017' (book) is now available on Flipkart at a discounted price).